Congratulations, you have graduated to reading tablature in its complete form, with 6 lines representing all 6 strings of the guitar. Now, with 6 lines of tablature, we are able to read notes and melodies on all 6 strings of the guitar: the high E, B, G, D, A, and low E strings. Now, THAT'S the real deal! The on-screen tablature presents the G Major Scale in 2 full octaves. The first section of the tablature represents the lower octave of the G Major Scale. The second section of the tablature represents the upper octave of the G Major Scale. The last note of the first section (the note G, played as the 3rd string open), and the first note of the second section, are the same note. The low scale ends on this note, the high scale begins on this note. 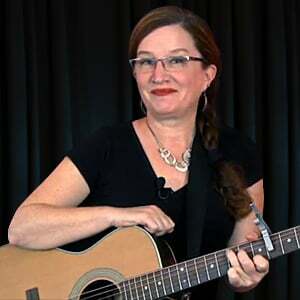 In the video, I play straight through the 2 octaves of the scale without repeating that note, as it is written in the tablature. 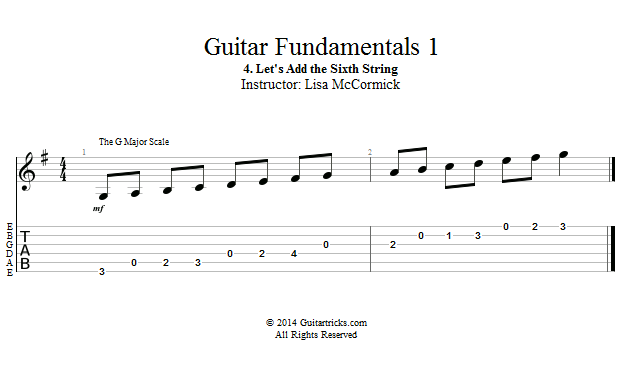 To follow along with the video lesson, please play the note G (3rd string open), only once.